I remember the first day “Uggs” became a trend in my area! My mom called me over to the computer to show me the new moon boot looking shoes that people were all talking about. Opera had added them to her “favorite things” list and it really got people talking. I hated them! I couldn’t tell if people were really serious. People actually going to start wearing these oversized lumps on their feet? I sat at the computer that day and promised myself that I would NEVER ever own or buy myself a pair of Uggs! #dramatic. 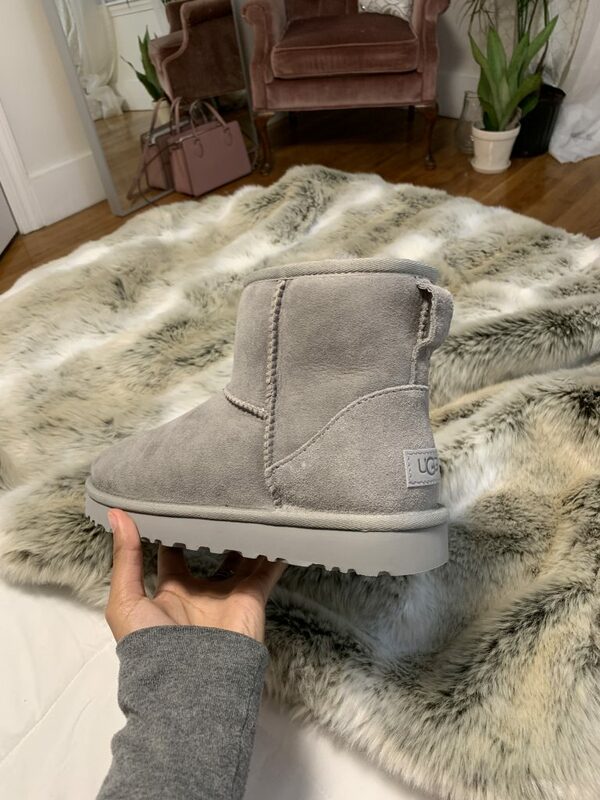 Flash forward to 2019, here we are, sitting on my bed with an Ugg box. It came in the mail last week and for a while, I wasn’t too sure how I felt about them. Now…you’re probably wondering how we got to this point, huh? Well, for Christmas my sister was asking for a particular pair of Uggs so two weeks before Christmas I found myself on the Ugg website browsing for that pair. After purchasing her Uggs, a suggested tab came up with pairs I “might be interested in” and something surprisingly caught my eye. There was a pair of light grey Ugg minis and these little guys were different! The logo on the back was a pretty dark brown and it contrasted nicely from the light grey that the boot was. I loved it, but I had to stick to my promise so I x’ed out of the website and that was the end of that. #dramaticagain. After Christmas, I went back on to the website to show one of my friends the pair that I liked. She was shocked that I found a pair that I didn’t hate, so she was intrigued! When I pulled them up, I was pleasantly surprised to see that they were on sale! 97.00!! (not including shipping and handling). You all can guess what happened next huh? I can’t pass up a good deal, so I went ahead and ordered them!! Two long weeks go by and I finally get them in the mail and now we are caught up to this exact moment. I open them up and….immediate disappointment. They don’t look like the picture. Yes they’re grey and yes, they are the mini’s but my favorite part from the shoe I saw online was not featured on the boot I got in the mail. For reference, this is the boot I thought I was getting in the mail…. Can you see my disappointment? I mean, they’re still kinda cute, and you best believe i’m going to wear them. I spent 100.00 on them! Im not crazy. When I spoke to the reps on the phone from Ugg, they informed me that they outsource their photographers for their advertising and that the boots that the model is wearing in the photo was a custom pair that was made specifically for the model. Those specific boots do not actually exist for purchase and no one who bought these sold out shoes would be getting what is actually advertised in the picture on their official sight. At least they are aware of their false advertising. They just don’t care hah. They informed me that I was not the first to complain about this issue and that until next year, this issue won’t be fixed. There are other boots and products on their site that are not represented properly through pictures and advertising. Overall, I was shocked that a company this big would be operating in such a way. However, how would I have known till now? Ive never ordered from them! So whats my lesson learned in this situation?? STAY TRUE TO YOUR PROMISES AND YOU WONT GET HURT!! haha! Stay tuned to see how I style these suckers!